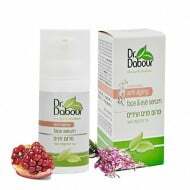 Pomegranate Restoring Serum for intensive feeding all skin types. Due to synergy of vegetable oils and extracts biologically active Tapuach serum supports the natural regenerative mechanisms of the skin, promotes the construction of collagen and elastin fibers, reduces the appearance of wrinkles. The preparation nourishes and protects the natural lipid barrier of the skin, giving it a velvety texture and natural shine. How to use: A small amount of Tapuach Pomegranate Restoring Serum applied 1-2 times a day to clean skin before using your cream. Borage oil, seabuckthorn and pomegranate extracts.